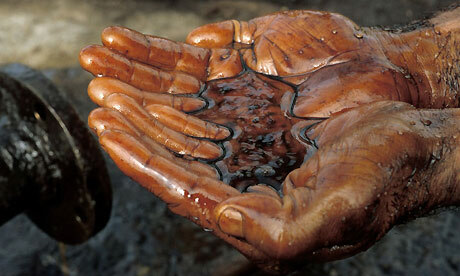 Whose Hands are Dirty with Nigerian Oil? A new timeline launched by oil watchdog Platform suggests that the role of British and US governments in the Niger Delta conflict links them to Nigerian military groups through oil giants like Shell and Chevron. The timeline, based on over 4,000 leaked US embassy cables from 2001 – 2010, is part of Platform’s ongoing investigation into the Delta conflict and an attempt to bring to light the involvement of Western governments, oil companies and security services. With the aid of interactive bullet points on the timeline, the secret documents strongly suggests that the US, UK and Dutch governments were aware and part of the situation for over a decade without putting an end to it. According to Platform’s findings, governments’ reluctance in holding major oil companies to account has helped spark and further exacerbate the conflicts in the region. Because no international law on human rights abuse by corporate companies exists, the charity alleges, the oil giants have been able to take advantage of working in a meagerly regulated and highly corrupt country. The Niger Delta has been troubled by violent conflicts ruled by rivaling military groups, corrupt governments, and oil spills destroying living grounds for years. Despite great quantities of natural resources, poverty is prominent throughout the country. The NGO argues this situation has not been helped by acts of oversees oil-giants. Platform has already claimed in 2011 that Shell knowingly helped Nigerian military groups in human rights violations by assisting them with lucrative payments to avoid disruption in their oil production. According to their Counting the Cost report published last year Shell’s involvement in the escalating conflict in the Niger Delta is still ongoing despite years of pledging to improve the situation. Platform’s claims that Shell was ‘fueling violence in Nigeria’ by paying off rival military gangs to protect oil production resulted in an article in the Guardian questioning Shell’s direct involvement with military groups in the area. Shell, however, has denied such actions. It has claimed to be respecting human rights. The company responded in the Guardian article, stressing that the report had strong focus on outdated and unproved cases and insisted that they were working to ensure Nigeria benefits from its natural resources. Several human rights organisations have highlighted the environmental devastation caused by oil spills in Nigeria, including Amnesty International’s ongoing ‘Corporate Accountability campaign’. The ‘Counting the Costs’ report was backed by a number of international Human Rights organisations demanding Shell to take responsibility for its actions in the Delta. It will however be interesting to see if Platform’s latest timeline will spark new interest in the issue and lead to more calls for greater accountability by Western governments in the region. Reblogged this on Unified Front.